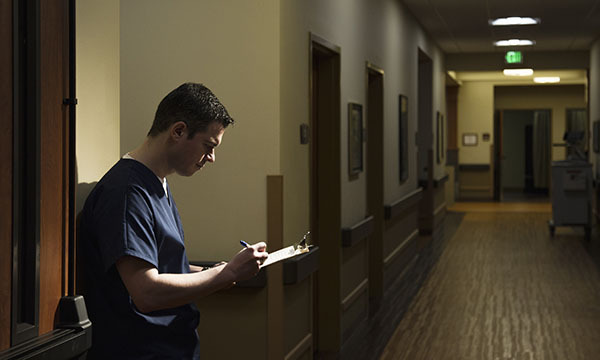 As the latest research on working night shifts shows a link with coronary heart disease, Kathy Oxtoby talks to the RCN's Dawne Garrett about the pros and cons of working nights and how best to cope. Working night shifts can play havoc with health and well-being. Research published in April found female nurses in the United States, who worked rotating night shifts for 10 years or longer, had a 15% or higher increased risk of coronary heart disease compared to women who did not do night shift duty. Night shifts can also impact on your mental health, says RCN professional lead for older people and dementia care Dawne Garrett. ‘This is largely because you are working against your body’s natural biorhythms,’ she says. ‘At night, your body goes into a different state than in the day. Nurses working night shifts can also have difficulty accessing face-to-face training opportunities. ‘There is a sense of not feeling so integrated with the wider healthcare team,' says Ms Garrett. Despite the challenges, there are benefits associated with working nights. ‘They can be better paid than days, particularly in the independent sector,' says Ms Garrett. 'There is also a great sense of camaraderie on night duty – it’s an opportunity to get to know and support colleagues, and a lot of personal friendships can be made’. Night working is also a chance to develop skills you would not necessarily be able to during the day, such as helping people sleep and engaging with family members staying in hospital with loved ones who may be receiving end-of-life care. To cope with working nights, Ms Garrett says good ‘sleep hygiene’ is essential. But if working nights is having a detrimental effect on your home and work life, go to your manager and request a referral to occupational health for support. Plan ahead – make sure your family understand the pressures of working nights. Have pre-sleep rituals, such as having a bath, a milky drink, reading a book or going for a run. Avoid watching TV or using technology in the bedroom – this can encourage alertness rather than a good rest. Turn off your phone and put a notice on your front door informing callers you are working nights to prevent your sleep being disturbed. If you are having difficulties with night shifts, seek support from your manager. Use night working as an opportunity to enhance your skills. Night shift workers have a 23% higher risk of becoming overweight or obese, a study suggests.